Northstate Utility Locating, Inc., has been in business since 2002. We provide locating services for a variety of clients using the most up-to-date technology available. We operate ground-penetrating radar systems and GPS mapping technology in conjunction with state-of-the art electromagnetic locators to provide the most complete picture of the underground world where you are working. While technology is important to us, the extensive experience of our staff is our most valuable asset. We are based near the center of the Piedmont Triad of North Carolina, allowing us to serve Greensboro, High Point, and Winston-Salem quickly and efficiently. 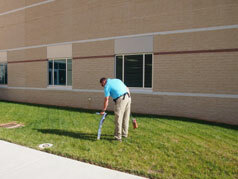 We also regularly serve customers all over North Carolina with a little advance notice. Our prices are very competitive, and we look forward to any comparison with any similarly-equipped company. Terraquest Environmental has used Northstate Utility Locating for many years. Northstate has been able to respond quickly and provide locating services for us throughout North Carolina. From locating utilities to underground storage tanks, their service and rates have been excellent. We look forward to working with them many more years.